The International Monetary Fund (IMF) published one of its most comprehensive studies of the state of banking and markets since the financial crisis titled, “Global Financial Stability Report – A Decade after the Global Financial Crisis: Are We Safer?” The October 2018 Global Financial Stability Report finds that global near-term risks to financial stability have increased somewhat, reflecting mounting pressures in emerging market economies and escalating trade tensions. It highlights that an intensification of concerns about emerging markets, a broader rise in trade tensions, the realization of political and policy uncertainty, or a faster-than-expected tightening in monetary normalization could all lead to a sharp tightening in financial conditions. The reports states that although the global banking system is stronger than before the crisis, it is exposed to highly indebted borrowers as well as to opaque and illiquid assets and foreign currency rollover risks. One of the key elements of the report is on balance sheet vulnerabilities which we cover here. 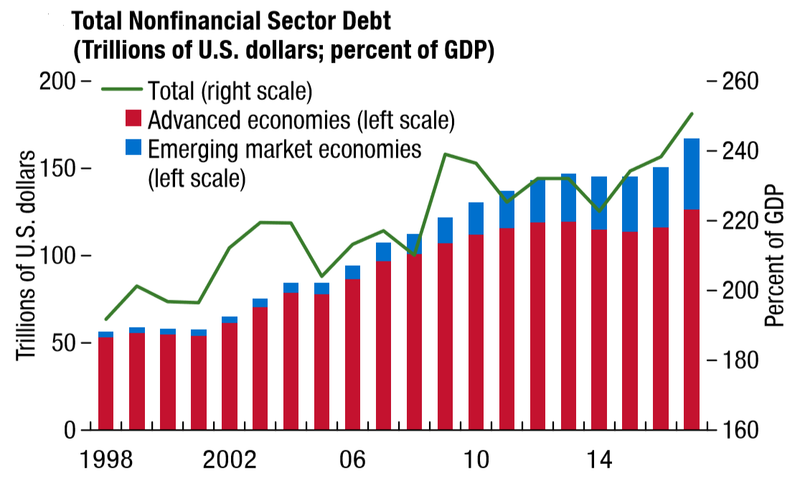 1 – Total nonﬁnancial sector debt has continued to swell since the global ﬁnancial crisis and is now over 250% of global GDP. 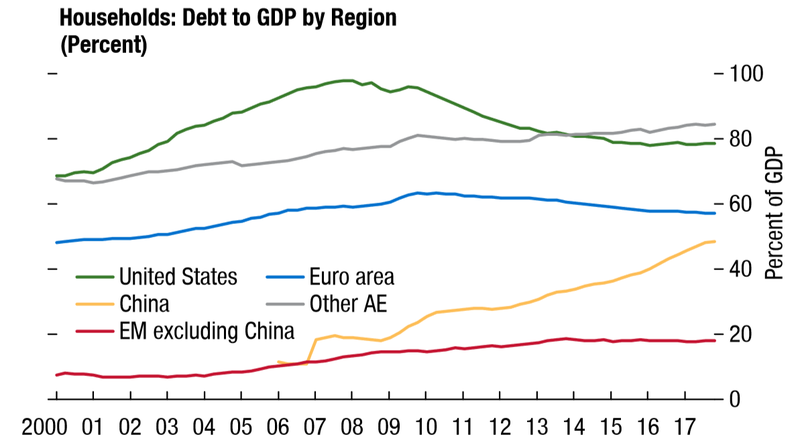 2 – Household debt to GDP remains on an upward trajectory in several countries, especially China. It is reducing for the United States. 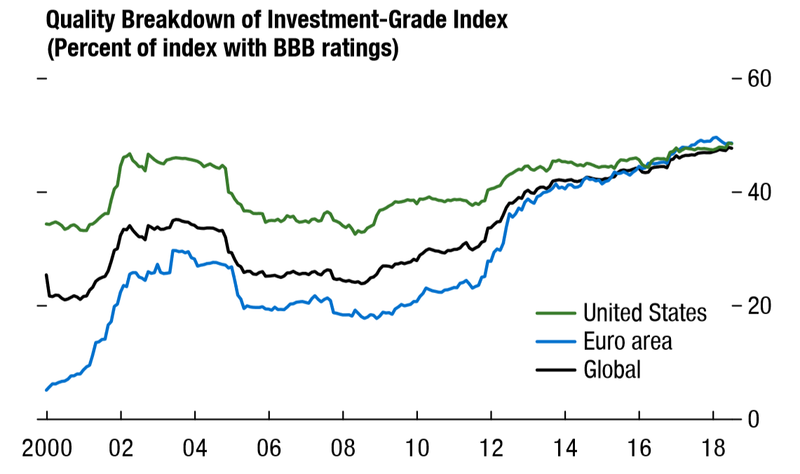 3 – There is broad-based growth in riskier borrowing, 60% of bonds have a BBB rating – the lowest among investment grade and just a notch above non-investment grade. BBB ratings are typically granted where the obligor currently has the capacity to meet its financial commitments but adverse business, financial, or economic conditions will likely impair the obligor’s capacity or willingness to meet its financial commitments. 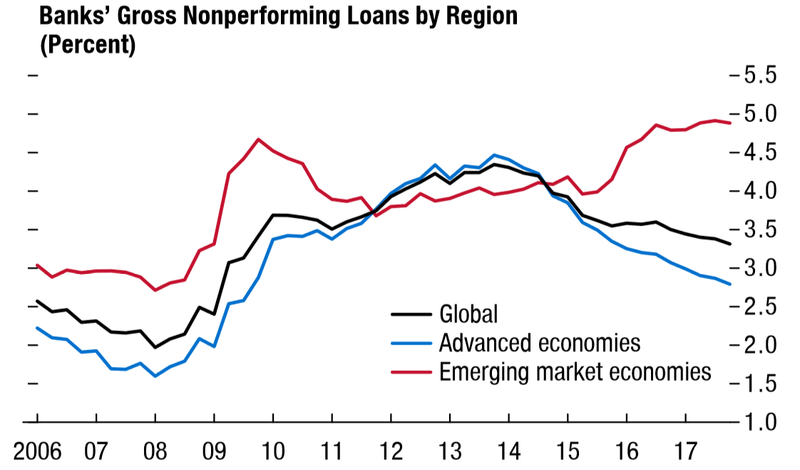 4 – And finally, weak underwriting standards have led to rising nonperforming loans, with soaring default rates in emerging markets.